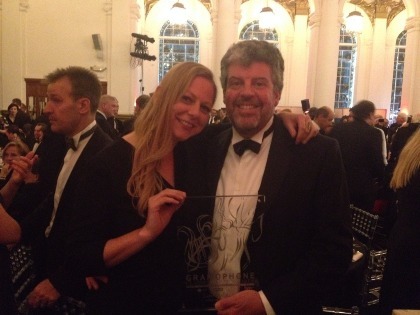 An interview with Steve Long, managing director of Signum Records, who just won Gramophone Magazine's Label of The Year award. Congratulations to becoming the label of the year as well as to your label's anniversary. How is Signum different today from its beginnings? The essence of Signum is the same as it was 20 years ago. We still strive to make great recordings of great music with great artists. The international standing of our artists and the scale of our releases has gone up but the basic philosophy is still the same. How do you curate your releases? Is there an overarching policy? Or does it develop sort of organically from project to project? How does a project then come into being. There is no set policy but one of the keys is that the music we record needs to be music that the artists are passionate about. We sometimes are asked by aspiring artists what music we are looking to release on our label but it dosn’t work like that. We are not going to suggest repertoire that we need and find that the artists then agree to record it just because there is a gap in our catalogue. We have just over 500 titles in our catalogue now and so there are thousands of hours of worthwhile repertoire that we will never be able to record and release but we like to have on going relationships with our artists and so our A & R policy is organic and we develop the release strategy with the artists we have on the label and the new ones that either we find or ones that find us. We started life as an early music label but then branched out into all forms of classical music. We developed a reputation for choral and organ music but this quickly expanded to include chamber music and orchestral music so we are now a well rounded, classical label. Do you ever do market research for Signum? Not formally but we are always researching the market based on what we do and what is successful. Sometimes it is useful to learn from one recording to another but we are still constantly surprised by what does well and what doesn’t do so well - often the results are not necessarily what we would expect. When Signum started, digitalisation was not much of thing yet. How has digital changed both your recording and production practice but also your promotional tactics? We haven’t changed the basics of our recording and production practices in that we still make the best recordings we can using the latest technology and the highest bit rates etc we can. We are now releasing some recordings digitally only supported by disc on demand services but what happens at the recording sessions is no different. We no longer feel restricted by the length of a programme and if it is too long for a single disc then we will put two discs in the case rather than re-jig the repertoire. None of this is an issue for digital of course. The advent of digital has affected the way we market our recordings though with so many more options and outlets for selling our music and promoting via social media. What would you say to someone as a recommendation who is thinking about starting an independent classical music label today? Never underestimate the costs of doing it properly and the amount of work and expertise it takes to do it well. Good one! Your repertoire is quite diverse, including lots of early music and choir music. Is it worthwhile looking into those specialities and niches or maybe even especially so since this special repertoire has more dedicated fans, who then buy digital or physical albums? If you release niche repertoire then the good news is that you can target a specific audience. The bad news is that the size of the audience may be small and as such you might not be able to be profitable. The beauty of streaming is that everyone can have access to your recordings at no additional costs to them so it is a good way of a label to widen their reach but also a good way for consumers to try music they wouldn’t have otherwise discovered. Peer to peer marketing via sharing playlists is becoming increasingly important. The good news is that younger people (who are our future) are able to listen to our music in ways that weren’t open to them 10 years ago. How do you see the decline of bricks and mortar record shops (at least in numbers) - is there a proper replacement to this in the digital word with many specialist blogs etc.? This is an issue in that there is still a demand for CDs but there are less and less places to buy them. There are a number of fantastic specialist retailers who offer amazing mail order services so it is still possible to buy the CDs but you need to know what you want to buy. Previously you could go into a shop and speak to a knowledgeable shop assistant who could advise you on what to buy. Now you need to do that research independently and then find the supplier who has the disc in stock. A lot of these good mail order houses have newsletters and blogs so you can get recommendations that way so the market is adapting and evolving. How much is a label also something of an agency to special and outstanding artists for example, James Rhodes? We are still releasing 50 recordings a year so there are many varied projects. We have a Rachmaninoff symphony cycle with the Philharmonia and Ashkenazy on the go, regular releases with the Choir of St John's College Cambridge, and also with Paul McCreesh and the Gabrieli Consort and Players. We have another Mozart opera with Classical Opera/The Mozartists - the next one is number 5 in the series of 23 operas (due to finish in 2035). We have a release with Tenebrae and the BBC Symphony Orchestra which includes Bernstein Chichester Psalms and more plans with Tamsin Waley-Cohen. We also have a triple album release with the King’s Singers to celebrate their 50th anniversary which runs from November 2017 to December 2018 with over 150 concerts all around the world supporting the album release so we are keeping busy for sure. Can you name one example which - truth be told - you did not actually expect to go so well but then it did? We had a release about 18 months ago with a choir from Ireland and it was our first release with them. They were recording Irish and Scottish folk music. We had some promotional videos shot to go with the album and they got picked up via social media and went viral over the course of 10 days with about 1m views in that short period. This resulted in a huge number of digital albums being bought and also physical discs in a number of countries including the US. I believe it was one of the top 10 selling albums distributed by Naxos in the US this year. Bluntly asked: Where do you see the future for music labels such as yours? Continue with dedicated good work? Diversify? Do you believe in "rent-a-Label" or "label as a service”? For us, I see the future is carrying on doing what we do. We are always ready to embrace changes and new technologies and being relatively small, we can adapt quickly. I see the size of our potential market growing in the coming years but streaming will be the format that expands. We will continue to do what we do and whilst i wouldn’t rule out diversification in terms of the sort of music we release, we will remain a core classical (what ever that means) label. We have a few jazz and cross over releases in the catalogue already as well as some dvds but i doubt we will have a wholesale change in genre. Clearly there are some successful “rent a label” or “label as a service” companies out there and there is a need and demand from artists to pay for such services but it’s not a model that we will be looking to adopt any time soon. Is there anything else you'd like to add as a summary? 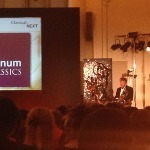 Yes: Many people in the classical recording business talk about "the good old days". My view is that they are here now! 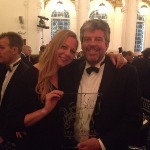 Photo: Steve Long at the Gramophone Magazine Awards with Classical:NEXT general manager Fabienne Krause.